Lowrance recently released its new series of fish finders, the HOOK2 models. This series is notably more refined and user-friendly in comparison to their prior HOOK units. 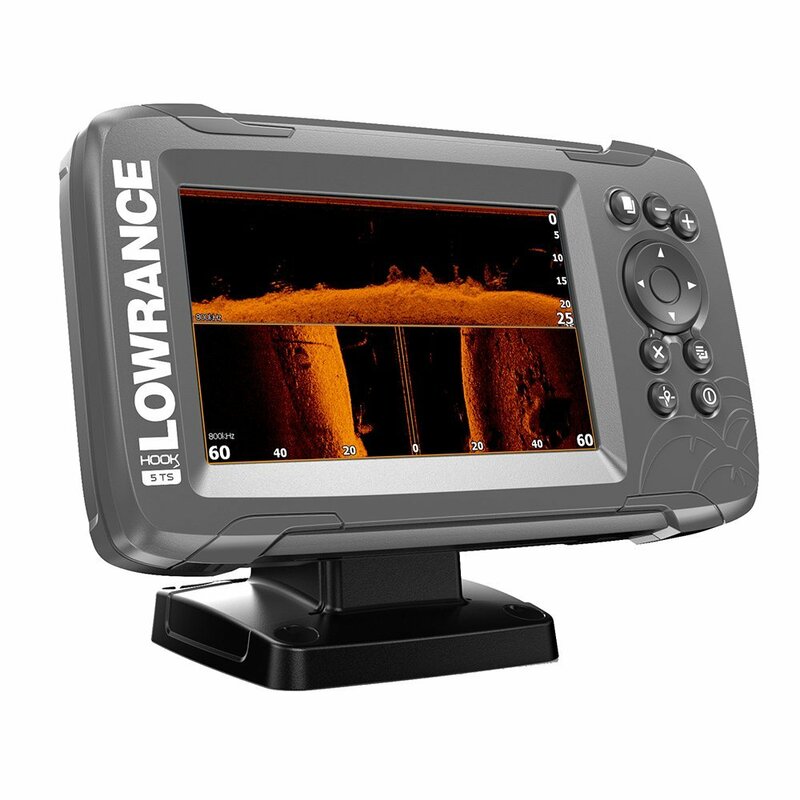 Lowrance has put emphasis on providing an exciting range of navigation and sonar features at affordable prices. One of the most intriguing units for the typical angler is the HOOK2-5 with TripleShot transducer. It’s capable of 2D Broadband CHIRP, DownScan, SideScan, and US Inland mapping and plotting. The HOOK2-5 TS features a 5″ display at a high-resolution 800H x 480W pixel screen. SolarMax LED backlighting and WVGA TFT color present bright, clear imaging at any light level. You can shift the viewing angle left or right or top to bottom at 50 or 70 degrees. A small keyboard to the right of the screen allows you to easily access all menus and use any function with minimal one-touch effort. The split screen view lets you see up to three panels at the same time. The unit has earned an IPX7 waterproof rating to withstand rainy and humid conditions of all kinds without error. The display unit is compact at 7.3″ x 4.3″ x 3.3″. The HOOK2-5 comes with a quick-release bracket and panel mounts, but not a sun cover. It does not offer wireless or inter-device connectivity. There are no NMEA or Ethernet ports, only connections for the power and transducer cables. But it does contain an open microSD slot so you can expand the unit’s software capabilities or transfer data. Previous HOOK-5 units didn’t have the SideScan capability of the HOOK2 series. The HOOK2-5 provides maximum depth readings at up 500 feet for the 2D CHIRP and 300 feet for SideScan and Downscan. The 2D CHIRP utilizes a cone-shaped beam while the 455/800 kHz frequency takes thinly sliced images and reassembles them for display. Neither does the 2D CHIRP use dual beam technology but instead operates at a single frequency of 200 kHz, compared to 455/800 kHz for the SideScan. This allows not only the 300 foot side-to-side depth range but a 100 foot zone at each side for fast response and high detail at the 800 kHz frequency. The 455/800 kHz sonar doesn’t utilize CHIRP technology like many other fish finders, but the images that result are very clean and crisp, with excellent target separation. The 455 kHz frequency provides the best depth capability at while the 800 kHz provides the sharpest images. Lowrance’s TripleShot 3-in-1 transom-mount transducer outputs 200 watts (RMS) in 2D Sonar and 500 watts (RMS) for DownScan and SideScan from a 12 VDC system, but will function at higher voltages of up to 17 VDC. A re-designed version of the previous TotalScan package, it also includes a built-in temperature sensor and a longer, narrower diameter 20-foot cable ending in an 8-pin connector. This allows you to drill smaller holes during installation. The data and power cables also come with water-tight connectors to prevent any leaks. The HOOK2-5 chart plotter allows you set up to 100 individual routes with 3,000 waypoints and 100 tracks at 10,000 points per track. It comes with a comprehensive set of charts for over 3,000 of U.S. lakes. Based on C-MAP charts, these provide bottom contours at 1-foot increments. Although not particularly detailed, they are very accurate for most major inland waterways. The HOOK2-5 is also compatible with a number of other charting systems. C-MAP shows details on tide and current, safety depths, filters, and other options. The TripleShot works with C-MAP Genesis and Navionics. With Navionics, you can take advantage of SonarChart Live, which allows you to create your own maps based on your sonar readings in real time. The Lowrance HOOK2-5 is equipped with highly sensitive internal GPS system that can access any WAAS, EGNOS and MSAS satellites for updates, even calculating your boats speed. The Lowrance HOOK2-5 offers an Overlay DownScan that allows you to overlay your DownScan imaging with the 2D broad-band CHIRP. This gives you a clearer perspective of fish arches compared to underwater structures or vegetation formed by the DownScan. You also get Sonar Recording, which enables you to record and review a sonar log whenever you like. Sonar Recording is very helpful if you want to review spots you’ve already scanned into memory. You can record the log to your choice of unit memory or a microSD card. StructureMap is another available TripleShot feature. It allows you to overlay your recorded SideScan sonar images onto your maps to get a clearer idea of submerged objects in relation to the shoreline. Other features you expect from a modern fish finder, and more, include Amplitude Scope, Bottom Lock, Fish ID, Flasher, Colorline, and Surface Clarity adjustment. The TripleShot transducer and sonar features provides several advantages over the prior HOOK units, and the addition of some excellent SideScan sonar is at the top of the list. It’s designed primarily for lake or coastal fishing from smaller boats, but has expandable charting. What it was meant to do it does well, with fast updates and clear images. It’s also very reasonably priced for a 5″ unit that does all that the Lowrance HOOK2-5 TripleShot can do. Though it does have a few limitations, the HOOK2-5 is still a feature-rich fish finder with great sonar performance. Inland fishermen, in particular, will have more fun catching more fish with this unit right out of the box.